Combine water, cream, and salt in saucepan and bring to a boil. Add oats, then sugar and dried fruit. Simmer for 6 minutes. Sprinkle with walnuts, cinnamon, nutmeg, and brown sugar and serve. 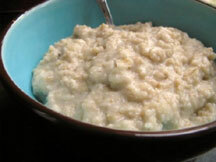 This oatmeal stores well in the fridge and is good hot or cold.